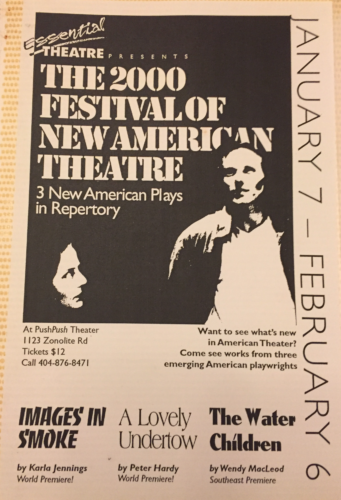 Our second Festival took place in January of 2000. This Festival featured Images in Smoke by Karla Jennings, A Lovely Undertow by Peter Hardy, and The Water Children by Wendy MacLeod. This was the year before the Essential Theatre Playwriting Competition began, but the Festival included two world premiere productions of new plays by Georgia playwrights.